What is a green smoothie? What makes it different from any other smoothie? What is a green smoothie? Why are so many people raving about them anyways? It is where greens are blended with a fruit smoothie. (I've even added greens to dessert smoothies!) It is actually very easy to cover up the flavor of the greens with the sweet fruits. Please, read more about this powerhouse of nutrients before you make any judgments against the idea. I ran home and started experimenting with all kinds of flavors and greens. I read all there was written about green smoothie recipes for weight loss, digital and paperback. As I continued my daily habit, I realized that my taste buds actually craved greens! Prior to adapting a daily routine with green smoothies... I hated greens. So, to say that I craved greens is quite an accomplishment. From my herbal school, I know how important greens are for the body. In the past, I just couldn’t bring myself to make greens be apart of my daily menu. I was very skeptical at my introduction to this odd colored smoothie. It was bright green! I was totally amazed that I was drinking a blended salad in a delicious pineapple smoothie. Then I noticed... As my cravings for greens were going up, my cravings for junk were going down! And believe me. I am not one to just sit down and eat a salad! Our bodies require a certain amount of nutrients to thrive. Drinking or eating something that is packed with nutrients will help satisfy our cravings as we go throughout our day. I also found that my digestive system improved by leaps and bounds. Here's how to know if you are having regular bowels with green smoothies. A lot of times I find myself stuck with the same old recipe every morning. Usually, banana, blueberries, and kale. But we all need to use a variety of greens. Every type of green and fruit has its own benefits. Some contain more nutrients in one area but not another. So, use a variety of greens throughout your week. Find out how to vary greens in green smoothies. You can even use herbs to mix up your smoothie routine. Examples: peppermint, dandelion leaves, plantain, comfrey flowers and leaves, horsetail, aloe gel, etc. People have used these herbal remedies for years and have seen great health benefits. In my herbal schooling, I was taught we need to chew our liquids and juice our solids. This means to swish the liquids in our mouth to mix up the saliva and the liquids together and to chew our solids so much that it becomes juice! When eating a salad, usually people do not sit and chew their greens until it becomes juice. With the hustle and bustle of everyday life, people swallow each bite as soon as the food enters the mouth. 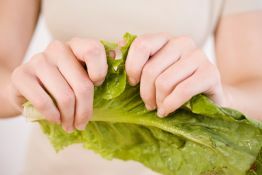 All leafy greens have cell walls composed mainly of cellulose, which is very difficult for our bodies to break down in order to access the dense nutrients that the greens supply. So, in essence the greens go in one way and exit the other with much of the nutrients still intact. That is where a green smoothie comes into play. When the greens are juiced or blended, those machines do most of the “chewing” beforehand. Getting the benefits of vegetables by drinking them can provide much more nutrients for your body to digest then by just eating them. To properly blend those greens, I consider the Blendtec blender the best blender available in the market! Vegetable gardening tips for the garden you always wanted! Receive the glowing benefits of spinach, kale, and other greens all year for only pennies. Enjoy the wonderful rewards of growing your own produce, by learning how to grow vegetables to make healthy green smoothies. Share and see green smoothie faces! Show how much your kids love green smoothies! So... what is the number of smoothies a day for best health benefits? I recommend 4 cups of green smoothie every day to maximize the health benefits. Click here to learn how this amazing smoothie changed my life. 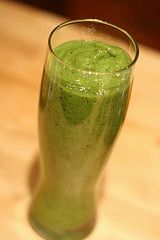 Learn about green smoothies from other health nuts! Feel free to ask anything about green smoothies! Been a green smoothie nut for a while? Awesome! Lend a hand to those starting out. You are where you are today because of those who helped you in the past. Let's pay it forward together! My Green Smoothie Is NOT Smooth - Help! Can I freeze my smoothies ahead of time? How much should I vary greens in green smoothies? How much weight can I expect to lose drinking green smoothies? How to make a 'thinner' smoothie? How do I blend greens into my smoothie? Freeze those bananas, and turn your smoothie into a frozen shake! How often and how much green smoothie to drink every day? What is the best time during the day to have a green smoothie?